My daughter loves to play with any toys that she has to be creative with. That is why our house is filled with creative toys. It is also why I knew I needed to get her some Bunchems. I had never seen anything like it before and I was excited to see what she would create with this new toy. *I got the products listed below from Spin Master in exchange for my honest opinion. 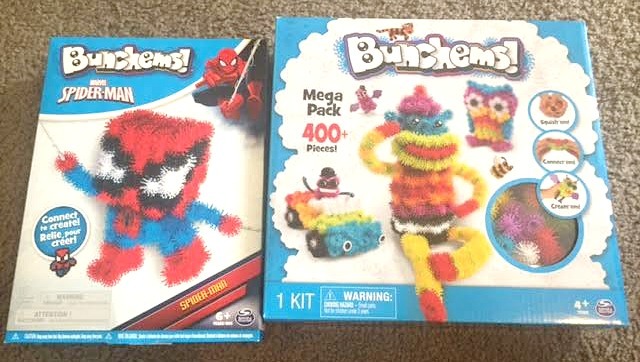 We got the Spider-Man Bunchems and the Mega Pack. I think both of these packs are a lot of fun. With the Spider-Man Bunchems you are limited to only four colors (red, blue, white and black) so the variety of things you can make is also limited. It is however a great option for a child who loves Spider-Man because the Bunchems Spider-Man is very cool. 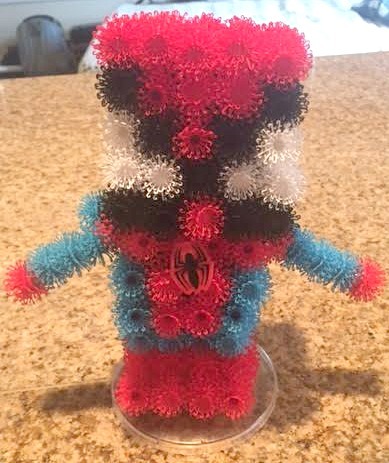 Look at how awesome Bunchems Spider-Man is! He comes with his own stand and Spider-Man emblem. With the stand he can be put into different standing positions as well. I thought he turned out really well and they have other characters as well that look just as cool! With the mega pack you get more variety. There is really an endless amount of things you can create with the mega pack. Oh and did you know that it only costs just under $19. That is a great price for a toy that will keep your child busy for hours! One word of caution is to make sure your child, especially girls, keep them away from their hair. It is also a good idea to keep them away from dolls hair as well. We got a few of them stuck in a my little ponies’ hair and it was very difficult trying to get them out. I even considering cutting her mane off. I would just make sure to make it a rule right away to keep away from any hair. Besides that we have a lot of fun with the Bunchems. My daughter is a little young for them, she is 4 and they do recommend them for 4 and up. So I would say they are better for kids who are at least a little older. But I am glad we have them for when she is more interested and until then I will have fun creating! 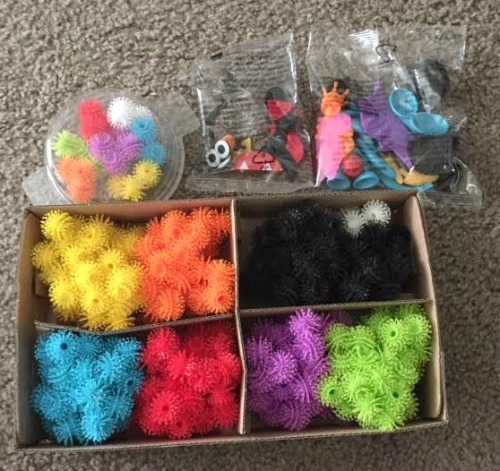 Who do you know that would love some Bunchems? Which character do you think Bunchems should make a pack for next?